Over the past eight years, Marvel has dominated the superhero landscape on the big screen, with their Marvel Cinematic Universe expanding over the years to the small screen. Along with the movies, shows like Marvel's Agents of S.H.I.E.L.D., Marvel's Agent Carter and Netflix's Marvel's Daredevil do exist in the MCU. But on the other side of the comic book landscape, DC Comics is taking a different approach. 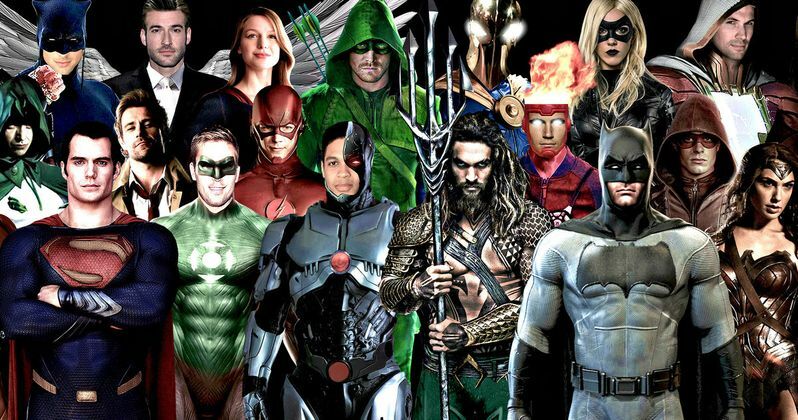 The small screen heroes such as The Flash and Arrow exist in a universe separate from the DC Extended Universe (DCEU), giving fans different versions of these iconic characters. During an appearance on the Hall of Justice podcast, Batman v Superman: Dawn of Justice director Zack Snyder revealed why he prefers DC's approach over Marvel's, and how much he enjoys the DC TV shows. "The bottom line for me is: I have 100% respect and love what they're doing on TV. I think it's amazing... and it speaks to the iconographic nature of these characters - these characters are bigger than any of the actors that are playing them. You know, long after I'm done making a Batman/Superman movie there'll be someone else who makes it. You know, who makes another one. It's almost like an American tradition now, we've established that these characters will be played and played again, and they exist outside of us in this moment. So that's the thing that I've embraced, and as opposed to just trying to shoehorn all these story lines into a single universe, we let the characters exist in multi-universe, and therefore it's a lot more fun and it's a lot more value for the audience. They get to see their favorite and most beloved characters on different adventures at the same time, in different universes. And it really makes the meal a lot richer and a lot more fun. We get to go with these guys in all different directions. And I think that's really the joy of what we're trying to do over here at DC." Of course, next month's Batman v Superman: Dawn of Justice is just the beginning, serving as a launching pad for Warner Bros. new DC Comics slate of movies. Just a few months after Batman v Superman: Dawn of Justice hits theaters, Suicide Squad arrives on August 5, followed by Wonder Woman (June 23, 2017), Justice League Part 1 (November 17, 2017), The Flash (March 23, 2018), Aquaman (July 27, 2018), Shazam! (April 5, 2019), Justice League Part 2 (June 14, 2019), Cyborg (April 3, 2020) and Green Lantern Corps. (June 19, 2020). This "multi-verse" with the movies and TV shows is more similar to the comics themselves, with several different stories happening at the same time for many heroes. Here's what the director had to say about how this universe is evolving. "I got to say, the joy for me is... I know it sounds goofy, but I'm like a kid in a candy store with this incredible opportunity. And it's really fun, and I think everyone involved on this end is really having a great time, and it couldn't be any better." After Batman v Superman: Dawn of Justice arrives on March 25, Zack Snyder will move on to Justice League Part 1 and Justice League Part 2, working from a script by his Batman v Superman: Dawn of Justice writer Chris Terrio. Do you think fans will ultimately prefer DC's approach, with multiple versions of iconic heroes on both the small and big screen? Or do you think Marvel has the better angle? Chime in with your thoughts, and stay tuned for more on Batman v Superman: Dawn of Justice.